Add the rich, earthy flavor of these hard-to-find mushrooms to everything from fries to fromage. Have you tried black truffles yet? Once you've had a taste of these hard-to-find mushrooms, you'll want to add their rich, earthy flavor to everything. This condiment set is here to help, with three small jars just right for sampling and experimenting. There's truffle salt, made using French grey sea salt— legendary on fries and transformative on eggs. 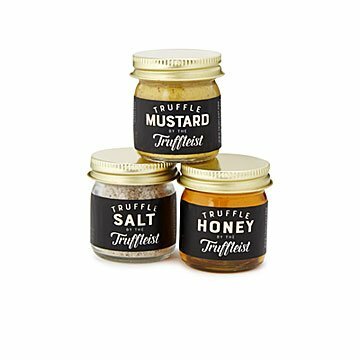 The truffle mustard will take your sandwich to a whole new level, and can even be whipped into salad dressings. Then there's truffle-flavored wildflower honey from upstate New York: Serve it as a fiesty accompaniment to a cheese plate, or add it to an unforgettable glaze. They make a great hostess or housewarming gift— or keep them for your own culinary adventures. Truffles sourced from Italy. Handmade by Jimmy Kunz in New York. Jimmy Kunz’s appreciation of food runs deep. He grew up in a home where his father was an award-winning chef. He gained exposure to international flavors as he attended the United Nations International School. And he found himself jobs cooking in restaurant kitchens, managing an organic vegetable farm, and in sales and distribution for an artisanal sausage company. This breadth of experience in the food industry gave him steady footing as he found his entrepreneurial inspiration: truffles. Truffles are difficult to grow commercially, and so they are still unfamiliar to many American diners. Jimmy developed his own recipes for bringing out the earthy, pungent flavor of truffles in ways that his customers would find irresistible and easy to use. In addition to providing his wares to restaurants and retailers, Jimmy distributes them himself through farmer’s markets and seasonal pop-up restaurants.